You are the story someone will tell. Do you have a story to tell? “I was born in Ruston, LA.” (that’s me!). My dad was a Marine (that’s me too!). My dad grew up in Staten Island, New York (still me). My dad was tough and hard. He was your typical Marine. That was my dad. Funny how times change. Now he is a bit of a softie…kind and sweet and caring…I am so thankful to have known both sides of him. I couldn’t ask for a better dad. And all along, even during the times when we butted heads, somehow I knew he loved me. He was loyal and forgiving and honorable and true – and still is. He is someone to be proud of…He is a story that I tell. He grew up on Staten Island, NY. His life was rough. His dad died when he was a baby. His mom was an serious alcoholic. He was pretty much on his own. Everyone he loved died early, and left him. He pulled himself up by his boot straps. How did he become a leader, and a caregiver, and a good provider? God fathered him. And God sent him my mother, who is just wonderful. That’s all I can say about her, and he would too. My dad, he’s not perfect. He would be the first to tell you that. But I wouldn’t choose anyone else for a father. He is super smart and really funny. And thoughtful – my mom buys most of the Christmas gifts; but he chooses something personal and special that is just from him. He had impossible standards for me when I was a kid. But now I know that it was his way of hoping that I would have a better life than he’d had. My dad was the kind of guy that would stop and change your tire if you had a flat, even if you were a complete stranger. I saw him do it plenty of times. My dad was the one who drove to come and get me, in the middle of the night, at college when I had an ear infection and I felt just horrible. My dad stayed up all night with me when I was in high school and I had mononucleosis – my throat was extremely swollen, and I was so scared. The doctor had said there was only a slight chance it would swell shut…ok, a slight chance??? I begged Daddy to tell me stories about when he was a kid. And even though he left for work before dawn, he stayed up very late, just talking with me. He never knew how that act of kindness would be a touchstone for me…he just did it. Have you ever thought of it that way? Twenty or thirty years from now, what will be said of you? Your story is a lifetime of interactions with other people – some long term, some short term. What stories are told about you? If your kids, your spouse, your friends, your co-workers, or your siblings had to tell a story that sums up your life – what would it be? Would it be the same story you tell of yourself? What legacy are you leaving behind? What footprint? Whose footprint? and do not lean on our own understanding (Prov 3:5). That we love the Lord our God with all our hearts and with all our souls and with all our minds…And that we love our neighbors as ourselves. (Matt 22:37, 38). That the love of Christ controls us…[and we]… no longer live for ourselves, but for him who, for our sake died and was raised (2 Cor 5:14-15). When someone was hungry we gave them food, they were thirsty and we gave them drink, they were a stranger and we welcomed them, they were naked and we clothed them, they were sick and we visited them, they were in prison and we came to them (Matt 25:35-36). Daily, we write the story others tell about us. In our words and deeds, whether we know it or not, we are telling people who we are. And we are telling people who they are to us. And we are telling people what matters most to us. What have YOU been saying with your life lately? 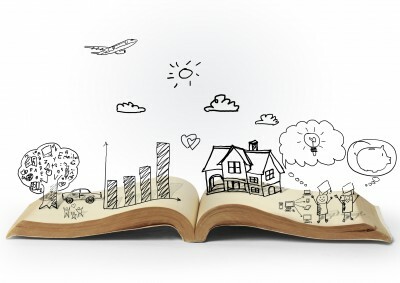 What is the story YOU tell? Britta~I am justAgirl...just like you! nice blog! I love the subject. I have girls. Loved it. So warm and personal. I’m glad you had your dad, he sounds so nice. Thanks for your encouragement to think about the stories others may be one day telling about us. It’s a good thing to think about.